It's peach season and I am lucky enough to live near Palisade, Colorado where they grow some of the most incredible peaches! I grabbed a huge box of peaches from a farm stand and knew exactly what I wanted to make. After I received a lot of positive feedback from my Better Than Apple Pie Apple Crisp, I wanted to try virtually the same recipe with peaches. The result being equally delicious and amazing! You can eat them as-is or on top of yogurt or granola...even served with a scoop of ice cream! They are also wonderful for meal prep and easy to make in advance to have throughout the week with various recipes. Enjoy! 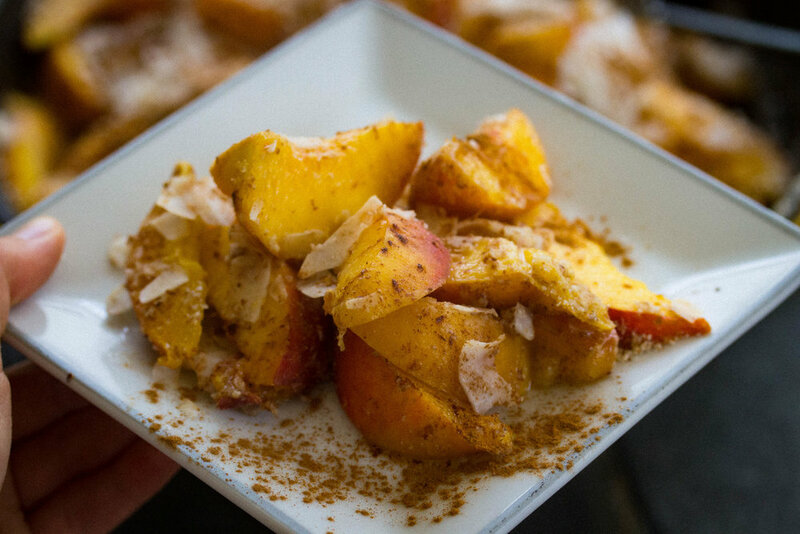 In a large cast iron skillet, melt coconut oil and add sliced peaches. Toss until well coated. Place peaches in oven and bake for about 10-12 minutes. Remove from oven, add almond flour and coconut flakes, toss until well coated. Place back into oven for another 5-10 minutes then garnish with cinnamon to taste.